Stressed Ge:Ga photodetectors were flown for the first time opening the wavelength regime 110...240 μm. The cold readout electronics (CREs) consisting of preamplifiers and multiplexers made of CMOS circuits pioneered these devices now also used in HERSCHEL-PACS. 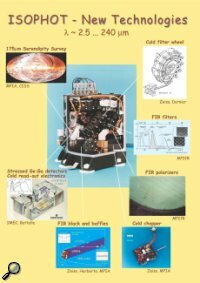 A "ratchet" filter wheel drive of very low heat dissipation and high optical accuracy was developed and successfully used in three wheels for ~1 million steps in the cryovacuum. This concept is now being used for JWST’s MIRI and NIRSpec instruments. A focal plane chopper with a driving power of ~2 mW was developed, and the concept is now used in an advanced and larger version in HERSCHEL-PACS. FIR filters based on wire meshes and organic and anorganic blocking substrates achieved highest passband transmission and extreme attenuation at the unwanted optical and NIR wavelengths. 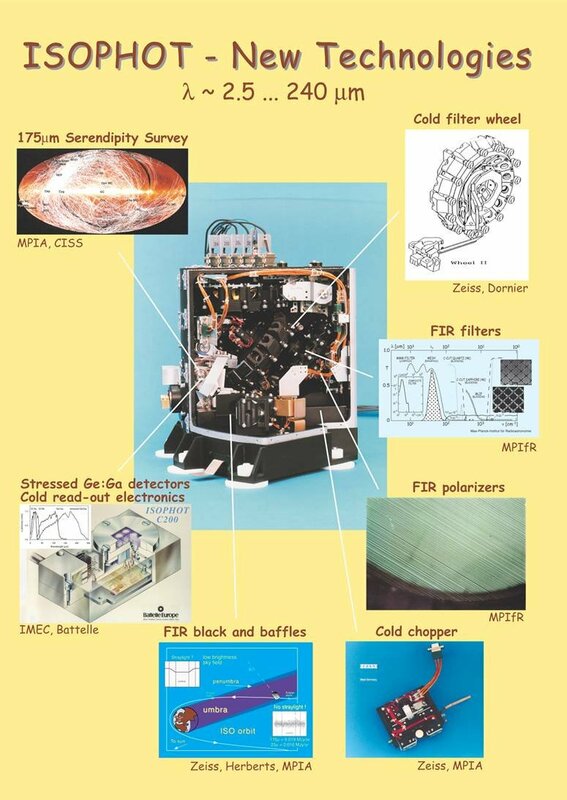 These and many other technological achievements of the ISOPHOT development were the base of MPIA’s successful applications to participate in the instrumentation of the next generation of IR space telescopes HERSCHEL and JWST. The mission operation (1995...1998) was jointly performed by ESA and four Instrument Dedicated Teams at Villafranca, Spain. The ISOPHOT Team was led by Ulrich Klaas, its main tasks were the calibration of the instrument, the development and validation of data reduction software and the optimisation of observing modes and strategies. In the Postoperational Phase (1998...2001), an ISOPHOT Data Centre was set up at MPIA in order to optimize the scientific return of ISOPHOT. The data reduction pipeline was continuously upgraded, followed by a major reprocessing which supplied high quality products to the ISO data archive. A large number of national and international visitors of MPIA were supported in the data reduction of their own observations or in new archive research projects. During the Active Archive Phase (2002...2006), the ISOPHOT Data Centre concentrated on: (i) completion of the scientific validation, (ii) upgrades of surface brightness calibration, (iii) elimination of artefacts and excess noise, (iv) composition of catalogues and atlases, (v) user friendly updates of documentation and (vi) implementation of interactively reduced "highly processed data products". These tasks were jointly performed with ESA and several of ISOPHOT’s CoI institutes in the UK, Hungary and Germany. Deep 200 μm surveys indicated strong evolution of galaxies in the early universe. 15% of the FIR background radiation (as measured by COBE-DIRBE) could be resolved as individual galaxies. A large number of quasars were detected for the first time in the FIR. This large new data base of spectral energy distributions confirmed the "unified model" of quasars and radio galaxies. For fifty ultraluminous IR galaxies, the new 200 μm flux values led to increased dust masses and luminosities. The hypothesis "galaxy merging → star burst → ultraluminosity" could be confirmed for many targets. The spectral energy distributions serve as a reference for potometric redshift determination of high-z submm galaxies. Inclusion of the 200 μm flux has increased the values of cold dust mass in spiral galaxies considerably. It was surprising that the outermost and coldest parts of these galaxies contain much dust already in the suspected primordial gas. In the Virgo galaxy cluster, the deepest survey for cold dust emission of galaxies independent of their mass, type, orientation and star formation activity was achieved. In nearby galaxies, new structures were discovered like the star formation ring in the Andromeda galaxy (Fig.2). It was possible to separate warm and cold dust, and emission from the spiral arms and the interarm regions. Emission of polycyclic-aromatic hydrocarbons (PAH) could be detected in all spiral galaxies. These obviously stable and ubiquously present molecules could also be detected for the first time throughout the plane of the Milky Way. A strong correlation of the PAH features with star formation (SF) activity led to classification of luminous galaxies with obscured nuclei according to their power source: SF or active nuclei. The 200 μm measurements allowed a more accurate characterisation of collapsing clouds and embedded prestellar cores, and the energy balance of many star forming regions has thus been understood. CO2- and NH3-ice lines in deeply embedded young objects gave hints on their physics and chemistry. The ISOPHOT Serendipity Survey was obtained during the otherwise unused slew time of the satellite. 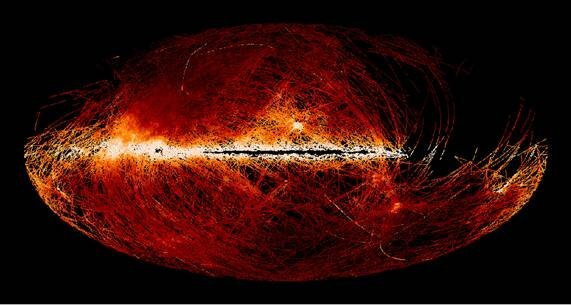 15% of the sky were mapped for the first time at a wavelength of 170 μm. More than 2000 objects were discovered or observed for the first time in the FIR. This resulted in a huge galaxy catalogue with the best statistical results on mass, luminosity, gas-to-dust ratio etc. Also, a target list of extremely cold objects (star formation regions, molecular clouds) in the Milky Way was obtained. These will be followed up with HERSCHEL. Asteroids were established as reliable celestial calibrators for the FIR, avoiding the NIR contamination of stellar calibrators. The fundamental sensitivity limit of "cirrus noise" was studied over the entire FIR range. It resulted in predictions for the next generation IR space telescopes; in particular, it is applied to the HERSCHEL confusion noise estimates. In total, nearly 1400 publications with ISO results have appeared in the refereed literature up to the end of 2006, and about 370 papers have resulted from ISOPHOT observations. The number of papers in conference proceedings is even larger. At MPIA and our CoI-institutes, several ISO-based publications are still to be expected. The ISO-data base, which will also be accessible via the Virtual Observatory, will be of long lasting value for future investigations.